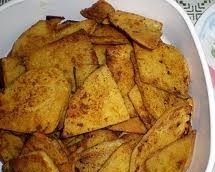 This style of fry is very delicious and every one will like it. Cut the Yam(Chenai) into squares of 1 cm thickness. In a shallow vessel place the yam slices. Add all the powders and 1 tbsp of oil Shake well so that all the powders are coated well on all the pieces. Pressure cook this for about 3 whistles. Heat a tawa and place the pieces one by one. Sprinkle oil around the pieces and let it fry. Turn the next side and fry till both the sides become golden brown.